I usually remember where I was or what I was doing when I decided to pick a particular book, especially when the book makes a lasting impression on me. 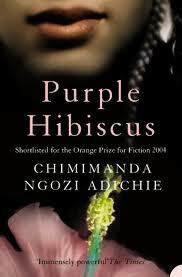 With Purple Hibiscus I remember every single moment that led me to buying, then reading, then falling in love. It was 2008, I was in Belgium for a weekend and for the journey back I wanted a novel to keep me company. I found a bookstore, which had a small 'non-European' fiction section. I had no idea who the author was (yes, I was really slow in discovering Ms. Adichie) but the synopsis (and the fact that it was a Nigerian author) did sway my decision to buy the book. Once I started, I couldn't drop the book. I read it in one sitting and before it even ended I became a Chimamanda Ngozi Adichie fan. Set in Nigeria, Purple Hibiscus is told from the point of view of 15 year old Kambili. Kambili, and her older brother Jaja, live a privileged but sheltered life. Papa is a strict disciplinarian, and their household is filled with religion and violence. This is in sharp contrast with their Aunty Ifeoma, who Kambili and Jaja spend a week with. Living with Aunty Ijeoma and their cousins, they get introduced to a new way of life - one of freedom, family, laughter, music and more. This book is amazing and is one that I would recommend everyone to read - even if you're not a fan of African literature - because Chimamanda Ngozi Adichie is a gifted novelist (can you tell I'm a fan?). She's amazing. This is definitely my favourite as well. This book is amazing, I read it in one sitting as well. It is vivid, raw and emotional, as with all of Adichie's work. I am eagerly waiting for another book from her! This was the first of her novel that I read. I also read it in one sitting and I absolutely loved it - became a fan instantly. Her next novel "Americanah" comes out next May, and I'm eagerly waiting for it.